Tired of using hand crank can openers that are at times more trouble than they’re worth? Do the tops of cans get mangled with the can edges left as sharp as razors? If the answer is yes to either question, you should consider getting an electric can opener. This kind can get the job done fast and the shape of the opened can that you’re left with is intact. You can even reuse it for craft projects! Our best electric can opener reviews can help you zero in on the best for your needs. So, what is the best electric can opener? Some traditional ones cut through the lid from the top but can leave very sharp edges, while newer types cut through the side wall just below the top to leave a smoother and safer edge. While some are standalone countertop units, you could also get a space saving one that mounts under a kitchen cabinet or a small handheld opener that can be stored in a drawer. Once you narrow down on one of these types, you can select a model based on budget, quality of cutting or versatility of the tool. Here are 5 solid picks to choose from, but you may also click through for more options in electric and automatic can openers. If you are looking for a basic low-cost and reliable electric can opener, then this is it. The Hamilton Beach Classic 76380Z will handle small soup cans and large #10 cans, without a problem. This unit has been around for years and is perennially a best seller. Why? Because it works time and time again. It makes a smooth and clean cut through the top of the can, and even if the cutting wheel has been gummed up from multiple can openings, it will still work flawlessly. It also has an auto shut-off once the can has been fully opened. With a product this good, if it ain’t broke, you don’t fix it! The actual cutting head is removable for washing, so you’ll always be able to easily keep it clean. There is a cord storage compartment on the back, and that means you can keep it on your counter top, if you frequently open cans, or tuck the cord away and put it into a cabinet. There is even a basic knife sharpener on the back, and although it won’t put a razor sharp honed edge on any blade, it will keep your kitchen knives sharp and serviceable. This is one of the true bargains in the world of electric can openers, a fully functional product that is inexpensive, yet will give years of hassle free service, opening virtually any can that you can fit beneath it. 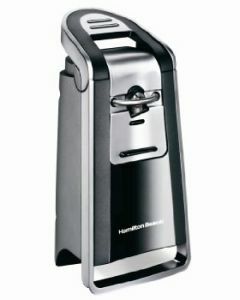 If you don’t want a sharp edge on your can and want a unique way to cut the lid off, the Hamilton Beach 76607 Smooth Touch Can Opener should be at the top of your list. You don’t even have to bother with pop-top cans as those can be opened with this too. The tall design means that it has enough clearance even for a 32 oz can. The design of this unit cuts the can open on the side and not the top. That means that once cut, there is no sharp edge, and you can just lift the lid off the can, much like lifting the lid off of any sealed bowl. In the world of can openers, this technology might cost you twice as much as a top cutting unit, on the other hand, you won’t have to worry about jagged edges after the can has been opened. Pouring out the contents is easier since there’s no place for the food to get stuck. The food inside does not get contaminated because it doesn’t come in contact with the outside of the lid and the liquid doesn’t seep out as the lid is being cut. It is simple to use too. Place the can against the cutting jaws, push down the rear facing lever and let the machine do all the work. After one complete revolution, release the lever and the can will have been been effectively cut open. That’s all there is to it. It even comes with built-in cord storage and a pair of kitchen shears with its own storage space for added convenience. This can opener does not stop automatically. You have to watch it and release the lever when you think that the entire top will come off. If you like appliances that do more than just one or two jobs then check out the West Bend 77203 Can Opener. You may pay a bit more for this unit, compared to some of the others, but it will give a good account of itself when opening virtually any sized cans as long as you use it correctly. It is a slim but extra tall device for use on large cans as well. While some users complain that it stops working after using it for large and heavy cans, the reason is usually because heavier cans should be held while the machine works on them to reduce the strain on the gears and to properly line the can up underneath the cutter. It will shut off automatically once it senses that the top of the can is completely removed. Its power cord retreats neatly when not in use and the cutting accessory is removable and dishwasher safe. There is a knife sharpener and and bottle opener included at the back so it is a device that can be put to good use. This under cabinet mounted electric can opener is as much of an American tradition as apple pie and baseball, and it has been hanging beneath kitchen cabinets since the 1960’s. So good is the design of the Black & Decker Space Maker Can Opener, that it remains the same basic unit with just a few modern upgrades. You essentially mount it beneath a cabinet, and when the time comes to open a can, open the door, place your can between the cutting gears, press a button and when the can is fully open the machine automatically stops. And because the can opener is attached to your cabinet, it has the potential to open the largest and longest cans that you can find anywhere. This multipurpose unit isn’t just an electric can opener though, it will also cut open bags, you can use it as a bottle opener and it will even sharpen your kitchen knives. How’s that for unmatched versatility? So if you don’t have much counter space, or if you are partial to American legends, then the B&D Space Maker should be an integral part of your kitchen appliances. Note: This can opener cannot be installed as is under cabinets that have “lips”. The underneath of your cabinet must be flat or you’ll need to get extra spacers. If you are looking for the most unique can opener on this list, you’ve got to see the Handy Can Opener One Touch Electric. It cuts the side of the can open, and leaves a smooth edge that is not sharp to the touch. This side cutting can opener is virtually automatic in every way. Simply place the unit on top of the can, turn it on and it will literally “walk” around the top of the can, cutting through the side, and turning off when it has finished. It works best on round cans, so those that have different angles, like sardine cans, for instance, may not open properly with this type of can opener. This inexpensive battery operated can opener comes as a two pack, and they work on two AA batteries, so in essence, this is the least expensive can opener pair on this list. However, it is also the slowest electric can opener here, but if speed doesn’t matter and safety does, these units must be considered. The batteries should be good for cutting between 10 and 20 cans, and the best advice is to get a couple pair of rechargeables so that you’ll never run out of juice. Unless you have trouble using your hands for any reason, this is a solid choice that will open virtually any sized cans without a hassle. ← What is the Best Popcorn Maker for Home Use?